St. Mary’s neighborhood marks an Eastern entrance into Brookline, very close to Boston’s Kenmore Square. St. Mary’s is sandwiched between Boston University and Frederick Law Olmsted’s well known Emerald Necklace, and is within a short walking distance to Simmons College and Emmanuel College. With all the nearby colleges, the streets of St. Mary’s are always populated with college students in addition to the local community. The shops and restaurants of St. Mary’s have stayed at their locations for a long period of time, becoming favorites for the locals. Location: St. Mary’s is located on Beacon Street, just West of Park Drive. The St. Mary’s neighborhood boarders the edge of Boston and is very close to many of its landmarks, including Fenway Park. Description: As you transition from Boston to St. Mary’s, you leave the chaos of the large city and quickly acknowledge the difference in the suburban neighborhoods of Brookline. Although St. Mary’s still maintains the city-like atmosphere, simple subtleties mark that you are now in Brookline. More trees and plants give color to the sidewalks and familiar stores line the streets. You feel at ease, and receive the college environment, as you walk the small strip of the St. Mary’s neighborhood. 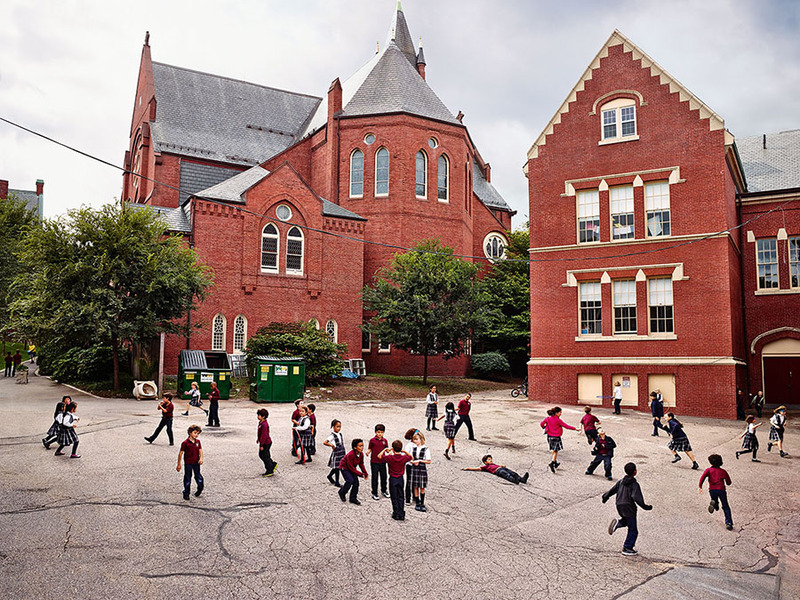 The architecture of St. Mary’s is much like other neighborhoods in Brookline. The neighborhood alternates between buildings for housing and small stores and restaurants. There are many apartment complexes and townhouses, built mostly of different shades of red and brown brick: hence the name “Brownstones.” The front of these apartments and townhouses have beautiful landscaping, with planted flowers, gardens, bushes, and trees, establishing an enjoyable atmosphere as you walk down the streets of the St. Mary’s neighborhood. The shops and restaurants have a very different look; they are built as smaller square buildings and with much simpler designs. Also near St. Mary’s, off of the commotion of Beacon Street, is Amory Playground and Halls Pond. Amory Playground provides large open fields, with a baseball diamond, tennis courts, and a lovely area for children to play. Halls Pond is also a charming spot, where you can enjoy peaceful time by the water at a hidden locale in Brookline. Also, in less than a mile, you can find yourself at either the gorgeous Boston Public Gardens or shopping on Newbury Street. How to get there: Public transportation is easily accessible for St. Mary’s. The “C” Branch of the Green Line runs directly to St. Mary’s. If taking the T from Boston to St. Mary’s, be prepared for the sudden adjustment from dark to light as you exit the 100-year-old underground T, for St. Mary’s is the first above ground T stop. In addition to St. Mary’s Station, neighboring T-stops include Hawes Street and Kent Street. Although no bus route stops directly in St. Mary’s, there are many nearby stations, including Fenway Station and Park Drive at Beacon Street. Buses 47 and 57 stop at Fenway Station, and bus 47 stops at Park Drive at Beacon Street. St. Mary’s is also easily accessible via car as Beacon Street is the main road running through St. Mary’s. Park Drive, a major road nearby to St. Mary’s, also provides easy access into the neighborhood. Parking: Diagonal parking spaces line the train tracks along Beacon Street, providing a significant amount of parking. Parking meters also line both sides of Beacon Street, offering another form of parking for St. Mary’s. Places to live: St. Mary’s offers a variety of places to live. A vast amount of brownstones, townhouses, and apartment buildings run along Beacon Street. Also, nearby roads off of Beacon Street, such as Carlton Street, Ivy Street, and Chilton Street, provides beautiful single family homes. Shops and restaurants: Many of the shops and restaurants in St. Mary’s have established themselves as favorites for the locals, as well as the BU students, as the shops and restaurants have held their same location for many years. There are several restaurants, including the Japonaise Bakery for teas and pastries, Taberna de Haro for Spanish tapas, and The Busy Bee for breakfast. The Busy Bee offers great food and has the feel of a classic 1950’s style diner. There are also small restaurants available in St. Mary’s including sandwich shops, sushi, cafes, and pubs, such as Beacon Tavern. The Beacon Tavern offers outdoor seating, providing a great atmosphere for their guests as well as for those walking Beacon Street. Although it may not be the epicenter for shopping in Brookline, St. Mary’s does offer a great deal of services. There are a number of spas, cleaners, realtors, and banks, including Brookline Bank, available in the St. Mary’s neighborhood. The neighborhood also provides a store for fine wines, a fresh market, and the long standing Economy True Value Hardware store. Ideal for college students in addition to the locals, St. Mary’s offers a perfect location. There is access to stores, restaurants, and services in the center of St. Mary’s and you are just a short distance from many appealing areas in Boston as well as Brookline.